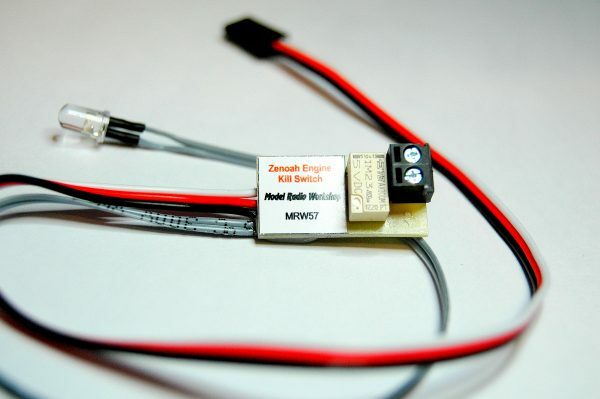 The Zenoah Kill Switch has been designed with the Zenoah engine in mind, but can be used with any magneto engine fitted with a kill wire. * Easy block terminal connection. * L.E.D to display the state of the switch unit. Plug the servo lead in to any spare channel (normally the gear channel), but any spare channel will do. In operation you will find that the Zenoak Engine Switch will operate around 1.6 ms on any channel on your transmitter, make sure your end points at set to 100% to guarantee the units operation. Don’t mount the kill switch close to the magneto part of the engine as this could have an effect on the kill switch operation. With everything switched on operate the channel on your radio that has the Zenoah kill switch on it, to light up the L.E.D. You will now be able to fire up the engine. To kill the engine simply switch the Zenoah kill switch off, the L.E.D will go out and the normally close contacts in the kill switch will short the black kill wire to engine ground as per the diagram. When using the Zenoah Engine Kill Switch with P.C.M or 2.4G radio it is suggest that you set a failsafe to turn the switch unit to the off state, this will kill the engine if the radio signal is lost.